I’ve been completely busy in the past few days, but today I’ve really got to share something with you. 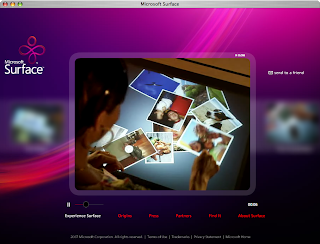 You know I’m a huge fan of Apple, but today I came across (via Mac Rumors) a video presentation of a brand new Microsoft product - Microsoft Surface - that just took my breath away. It’s a multi-user multi-touch 30in-ch display on which your fingers do the magic. No mouse, just playing around with your hands or other objects. I suggest checking out the first look article with video at Popularmechanics.com, which explains the capabilities of this new product in more detail, and the official Microsoft Surface site. Finally, the technology we’ve been waiting for years is a step closer to the consumers! Of course, it will be a quite expensive, but it’s a step in the right direction. I know I will have to wait to get my hand on one of these surface computers for quite a while, but I can already see many great things one could use such a computer for, can’t you? :) This time it’s definitely thumbs up for Microsoft!